The power of the 1st party claim is changing in value and in terms of being required. The uses, value and potential of the 1st party claim has not been reached. It’s actually just the beginning of changes to the power of your 1st party claims. We’re in the early stage of realizing the fuller potential of raising the value of individual input. We know that the claims we make as the 1st party can do more and can play a larger role at this time. As of today more jobs require that you are in a positon to become aware of the new incoming claims. You may not need to be aware of all incoming claims, but in a growing number of cases it’s becoming a requirement that you have the 1st party claim for proof. For the average person the point of sale was only a point of sale. As terms like data breach became more frequent there was a realization of the value that was stored. And at the same time bits of information un-important to the provider were being weaved in to products with value. What’s missing is your input which is a compilation of all your experiences and conditions. At each stage of your life you have more to share, stuff that previously was not there, and so there can be uncaptured value that was not there as well. The data-miners, IT workers and the industries that employ them have created value; value from your 1st party experiences. This new industry is making products and services that were previously unavailable, suddenly available. The products and possibilities are lining the shelves of the marketplace as disrupters. Disrupting how problems would be solved and how they will be defined forever. Let me ask you this; where are the best places to start collecting 1st party claims, experiences and suggestions? It’s worth knowing because it’s a gold rush to get the most and best information that can be used for an advantage. The uses of 1st party claims include validation, examination, theorizing and predictive analysis. Nothing is wrong with capturing 1st party claims, the main problem is caused by the handling and value sharing policies. It has become more mandatory today that we assign a value and requirement for citizen claims. The reason for these new standards are mandated for tracking, trust and transparency. Susan was one of 200 people selected to give answers to 3 questions after an employment selection process. The group was chosen to participate because the 1st party experiences can many times describe what would be difficult to see. Comparing and contrasting 1st party claims should be a part of organizing the individual’s inputs. When we are unfairly treated most of us get that message as it comes from the one giving the treatment. Our failure to address small grievances and perceptions can more likely feed a larger problem. Leaving small problems to feaster for personal or professional gain can be a strong temptation. From hiding black mold to questionable medical experiments in prisons; these problem hiding practices create social consequences for all of us. Hiding the 1st party claims are an act of anti-social behavior. It’s anti-social behavior that can make life for the rest of us more dangerous and precarious. Too many public administrators are hiding the 1st party claims to save money, protect friends and promote blindness through practice. This blindness opens an environment for big corporations and institutions to hide a significant number of 1st party claims that belong to the public domain. The number of 1st party claim collectors is growing. The importance, value and requirement of the 1st party claim has grown significantly. We‘re encouraging citizens to join organizations that share the 1st party claims they collect to improve advocacy for their members. Effective citizen organizing begins at the point you have a claim to share. The current problem we’re working on, is how we can capture the nuance occurrences that originate just prior to the cause for having a particular 1st party claim. At present we’re addressing the current problem by creating an auditing process for the claims. That process is designed to be built in to organizing and advocacy that’s’ started at the point of awareness of a claim. A set of handling policies have been created to give us a measurable value for each 1st party claim. The process has made auditing the problem-solving easier and more precise. Without the process of mate3.com networking it would be more difficult to bring improvement to advocacy for the average person. Without the changes we bring it would be the same as trying to settle a numbers dispute without the numbers. The individual that is collecting our 1st party claims is important and must be accountable. One of our best practices is registering those that are collecting the 1st party claims so we can more easily track and retrieve the collections on request. Requiring 1st party feedback experiences; after workshops, interviews, classes and contacts has been insightful. We’ve learned to stay positioned for becoming aware of incoming claims at the earliest possible point. We’ve also learned to use mate3.com networking to improve our position from which to respond. The potential of matching and connecting advocacy and organizing is in its early stage of development, but emerging rapidly. Solving the historical claims and problems associated with complaint collectors, and their biasness is part of our work today. We’re adding focus and policy making to the process so as to facilitate the work of the problem solver. When it comes to best practices and suggestions for empowering the 1st party; mate3.com networking is bringing continuous practical improvements. Denario is an organizer who worked directly with Perry Keys the VP of mate3.com. Denario’s specialty became arranging the 1st party claims for problem solving; he was first to introduce 1st party reporting check-points to get more clarity among the impacted. Those check-points leverage the value of our claims; and have created added opportunities for the 1st parties. After the check-points yielded the expected insights; Denario set-up an agency to represent and promote the collectors of specific 1st party claims. The collectors and potential collectors that joined the agency had solidarity that is based on continuous engagement to solve problems. With the engagement of various 1st party claim collectors we allow easy separating of opinion, theory and belief’s so the individual’s narrative can flow. 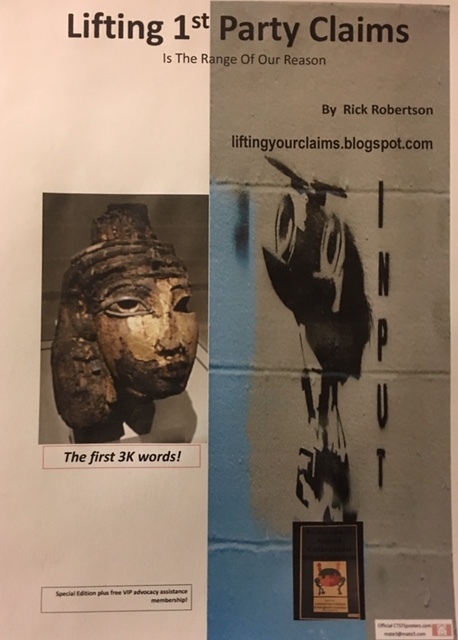 The mate3 method is a filter for receiving 1st party claims and directing them to those with similar claims, responsibilities and obligations. Shortly after Denario’s new agency was activated we started generating odd-jobs that paid roughly 20% above the prevailing hourly wage. The first jobs were limited but ranged from claim collecting, organizing and door to door information distributing. After that we added public speaker jobs to carry the invitation to join a mate3 connected group. Denario targeted the 1st party claim givers and their supporters with odd-jobs doing more collecting and advocating. After that we added information workers, marketing workers and lobbyist. Finally we contracted for legal and financial services and advice. In 2012 Denario was the victim of a suspicious hit and run while leaving a dry cleaners in the city of Detroit. At the same time the side hustle of 1st party claim collecting, trading, renting and selling started to rapidly grow. Within 30 days of Denario’s hit and run, 3 policies to validate good advocacy emerged; (1) having citizen oversight at checkpoints to validate the sources of input and 1st party claims. (2) Having transparency of input and 1st party claims that are to be used to define the problem and validate the solutions. (3) Using a Public Claims Posting Administrator more often to post the incoming 1st party claims for public review. Angela Reiss and her friends were allies of big tech who wanted the mate3.com formula, e-mail lists and strategies. Angela had become an acquaintance of Denario’s after being a fundraiser for his latest research project. With Denario hospitalized her attempted takeover was facilitated. The quality of 1st party claim handling for the average person was at stake. Angela had drained the reserve operating capital and took control of Denario’s personal computer and files. All the files and hardware were sent to technology investors to extrapolate the usable value. Because there are intellectual property components that are needed for making a 1st party claim based organizing App. Ian Xiong discovered that much of the needed data was “gapped”. In this case his discovery meant that important parts of the data that was taken from Denario’s laptop were not enough. The first 4 characters of email addresses and contacts were there but not the next 8. Coded phone numbers and multiple languages were used; this made translation of the business plan illegible. Angela and her team tried to operate the network, but desperately needed the map of relationships. It was mate3.com’s game changer security response policies that caught the takeover of operations. The number of incoming claims dropped suddenly and the decreased shared revenue followed. The agency that Denario had set-up was having problems raising funds to pay collectors. Since Angela and her takeover team were unable to make contact with agents of mate3.com; the network was failing. During the “Feed The Knowing Project of 2013” it became obvious. When the trust triggers were not engaged; another alarm went off for those in the network. Now that whispers of a change in power had become validated, multiple claim collectors started organizing to retake control. Denario popularized getting advocacy assistance started from the 1st party claim. He also put an emphasis on the impacted parties to be the first to issue the recommendations for a solution; and that’s exactly what happened. The attempts for a takeover of the mate3 advocacy assistance network were being rebuffed by the policies for check and balances. Later in the year Denario regained consciousness and started submitting answers for mate3 networking; that’s when we learned that he was going into physical rehabilitation. As his claimed experiences and suggestions traveled the networking pipeline; additional confidence was restored in the scaling up of mate3.com. The self-inputting of 1st party claims for connecting advocacy assistance has demonstrated value. With best practices for handling the claims collected with the mate3 operating policies; we can measure accountability. Now that we’re getting convergence and management of 1st party claims; we’re better positioned to expand access to co-advocacy organizing to others. The mate3.com model has automated assisted advocacy in a way that empowers the average person. The mate3.com policies against 1st party claim theft were credited with protecting our network from the hostile takeover. Steven Butu the data analyst that detected the irregular claim handling by the takeover team passed away; shortly after his discovery. Getting back to stable health took months for Denario, but as time would have it he’s back moving forward. The work of organizing new behaviors for handling our 1st party claims is a continuum. Denario pressed on to host a conference call where he described the levels of empowerment for the 1st party claim. He pointed out that we we’re now able to set the value, rules and requirement of our 1st party claims; which is the first level of their empowerment. Having the first level of empowerment is your foundation for creating mutually agreed communication. That’s the kind of relationship with others that’s needed to scale up cooperation; which is the producer of both profit and benefits. The second level of empowerment for our 1st party claims is the ability to set the policies that help us track, audit and identify when our 1st party claim is being misdirected, manipulated, misaligned or stolen. The third level of empowerment for the 1st party claim is the law. Laws that mandate and subject violators to appear in court, show cause and receive penalties. The team had become highly motivated as a result of the attempted takeover. Tools like the accu-point search option were launched to identify the best points for collecting 1st party claims. The accu-point search service itself has become a useful tool for collectors to find sources and places to get 1st party claims. Having the right collection points can reduce the cost to validate and invalidate reports from 3rd parties. And still to this day we want citizen suggestions of places, people and times that we should collect 1st party claims. The claims we collect can be used to improve the accuracy of citizen advocacy. In 2017 Perry Keys started offering pre-input collection prep-sessions. He was realizing the potential of long range planning to collect targeted 1st party claims. Perry was first to see the benefits of getting pre-experience sharing agreements with potential 1st parties. Perry was trained to think like a visionary and that sparked his curiosity to compare. He had decided to compare the participant claims and experiences with those in presented reports. This method of pipelining 1st party claims is validating success, saving money and time. Perry’s work in this area is aiming to directly distribute the collected 1st party claims to organizers, problem solvers and those with similar claims. His method continues to improve problem solving through collecting and adding long-range input from 1st parties. We can get to the clearer definitions and best practices for handling the individual input; if we try. As more 1st party narratives come in they will push us toward greater awareness and more transparency. There are so many uncollected policy suggestions that have painstakingly emerging from the experiences of victims; I’m asking what happened. When the victims are not heard it causes our society to loss learning from their 1st party claims. Our social division of power and value has caused the practice of routine undermining of the 1st party claims. This pattern has developed over time and is a direct result of chasing efficiency over truth. Having the narratological input has become a needed component for engaging individuals in making change. It’s also needed for them to build confidence in their 1st party experience based activism. Since you are the essential witness if you are the first party, it’s important that you know how to maximize your advocacy impact. So asking if there are records kept of the 1st party claims that have been collected; is becoming a standard inquiry. The 1st party claim based method of organizing is emerging as a reference guide simultaneously with technology. Our initial focus was on attracting the user to the better tools for advocacy. It took the first few years to determine that the need was for the mutual agreement to have exchange. We also learned that If we wanted better advocacy with acknowledgement of 1st party claims; we needed the mate3.com networking method. Retiree Paul Williams had been a care giver for his handicapped brother Jim in 2018. A false claim from a neighbor forced him to show cause in probate court. He felt his court experience was so bad that he wanted to alert others, his activism was based on his 1st party experience. Paul did a mate3 search to see if a search would yield any input that could assist with his efforts. Later Paul and mate3.com launched a victim support group that crafted new policies, recommendations and advocacy actions. We’re creating the environment for 1st parties to have the freedom to speak up with authority. Being able to speak up not as a guest but as the MVP. We employed 3 actions to engage the impacted parties; (1) Collecting and having their 1st party claim. (2) Doing outreach to others with similar claims and interest. (3) Agreeing to promote the recommendations that come from the impacted persons. In our work the closer we can get to the place of occurrence and the point of contact, the better. We’re also working to capture the impacted person’s claim as close to its original proximity and context. We want our individual experiences to have a longer life, more uses and a higher value. We offer a growing network of problem solvers and supporters that can start organizing advocacy from the 1st party claim. We are people with an intention to solve problems and build empowering relationships with you. Gloria Fiorand joined a pre-mate3 group at her band practice. 3 weeks later while waiting for a bus to school she was approached and molested. After that encounter, members of her mate3 group urged her to submit her 1st party claim, and ways others could help. The result was that we not only found support, advocates and others who had similar experiences. But Gloria also got connected with a local mother that was in the process of getting funding for a public safety camera for that bus stop. Today that bus stop is monitored 24/7 and her attacker has since been captured by police. Our Pre-mate3 affiliate groups recruit individuals for networking before they need advocacy support. The mate3 way of lifting every voice is the more transparent and the more accountable method to audit 1st party input. Our policy of requiring mutually agreed communication before representing 1st party claims is becoming a benchmark of best practices. The call to establish uniformed practices for handling of the 1st party claims of average people; is being fulfilled at mate3.com. We have built affiliation through common experiences and searches for solutions. By using 1st party claims for public education we found that it can transform individual claims into political education. When we discovered the engagement and inspirational value of 1st party claims we incorporated those values into our organizing models. The results have been promising for building a critical mass of public support to formulate mandates for public action. Your 1st party claims have value and they require policies to be protected. They have value to the owner, and should have value to the ones that get them in their possession. Unfortunately our claims are only as secured as our resolve to defend them. Our 1st party claims can give direction for problem solving and activism. The commitment of ourselves and affiliates has been demonstrated by the investment of time and resources. We started and stayed true to our objective to raise the struggle for lifting every voice. Right now! We’re recruiting collectors of 1st party claims, suggestions and individual input. We are also increasing the number of collectors we have around the world. We’d be interested in talking to you about becoming an individual input collector. We’ll help you to start-up a 1st party input collecting and presenting enterprise. You can easily learn the best practices for earning value from your collection(s). As a member of the mate3.com network you will be able to register as an identified collector of targeted claims. Our marketing program will also assist you in locating and attracting additional claims to your collection(s). If you already collect individual claims you can register the types of claims you already collect with us for free. Contact us at: mate3@mate3.com.